Downey Daily Photos: Weather "flag"
Weather vanes are both ornamental and functional since they can be used to show the direction of the wind,. Vanes are designed and balanced to point into the wind. So any observer could tell which way the wind was blowing. In Medieval times, weather vanes designs were often derived from pennants or flags. In fact, according to Wikipedia, the word "vane" is the old English word for fane, meaning flag. 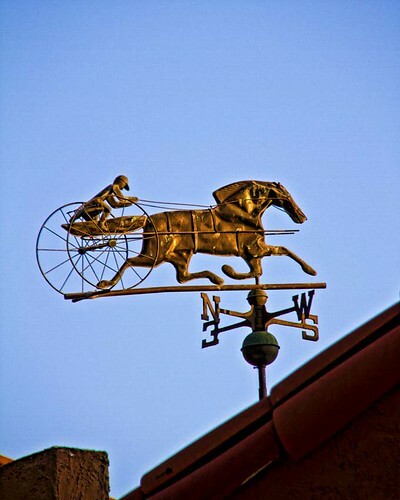 To see examples of other local weather vanes click here.